Happy Friday! Popping in quickly today to share another gorgeous item from Pink Blush. 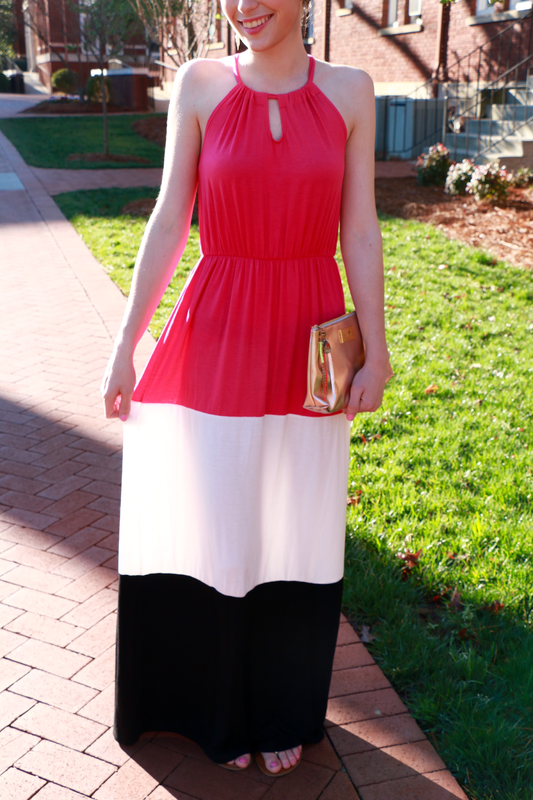 This color block maxi dress is so stunning! When I ordered it online, I honestly wasn't sure how I would like it in person. It completely blew away my expectations! 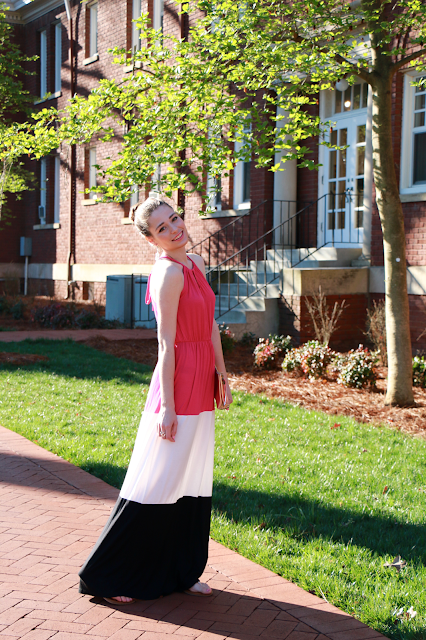 It is so comfortable, and one of the most figure-flattering maxi dresses that I own. It could be worn very casually, or with fancier hair and makeup for a dressier look (which is closer to what I tried to pull off here). Be sure to check out the two other recent blog posts that I did with Pink Blush, which you can find here and here. They have some lovely spring and summer items in their collection right now! Another great thing about Pink Blush is that in addition to their women's' collections, they also have a very stylish maternity line. If you or someone you know is expecting, definitely look to Pink Blush for your maternity clothing needs! I hope that all of you are having a great start to your weekend! Despite having a lot of homework, I am excited for this weekend because of some fun plans with Charlotte and North Carolina area blogging friends on Saturday afternoon! Be sure to follow me on Instagram and Snapchat @miss_alk to keep up with the fun. Thanks to Pink Blush for sponsoring today's post. Thank-you for continuing to support the brands that support Southern Belle in Training! This dress looks SO cute on you! I wish I could wear sandals, it's currently 35 degrees in Wisconsin! This maxi is so pretty! Excited for the meetup tomorrow! I agree with you that this Maxi is very flattering on your figure! I love the color blocking style and neck like. Have a great weekend doll. I love that dress! Maxis are my favorite for spring and summer. Hope you have a lovely weekend with blogger friends! That dress is lovely. Such a cute dress and perfect for this warm weather we've been having in Charlotte lately! Hope you have a great weekend! You look so lovely. I always am so excited when I order something online feeling sort of iffy about it and then it WAY exceeds my expectations. You're gorg! This is a perfect look for spring and summer! You look great!! I love that dress on you. Have fun with your blogging friends and enjoy your weekend! Such a perfect dress for spring weather! Love this dress on you, it's gorgeous! Hope you have a great weekend!! I love maxi dresses! This is super cute on you. Such a pretty dress! So simple and perfect for spring!! I have never owned a maxi dress but I love how they look. I am pretty short and I just need to get one and get it tailored to fit my stature. You look amazing! You look so lovely and it is very figure flattering! Love how you styled it! This dress is gorgeous! Love, love, love! You looking so pretty in this dress you have a good sense of fashion.thanks for sharing with us this post.